Vivian Dupont, 94, passed away at Golden Living Center in Tell City on September 6, 2018. She was born in Perry County, Indiana on March 10, 1924, daughter of the late, Oliver and Mary J. (Landers) Howell. Vivian was united in marriage on June 7, 1941 to Raphael Dupont. She had retired as a cook at Perry Central Schools. Vivian was a member of St. Mark Catholic Church and William Tell Senior Citizens. 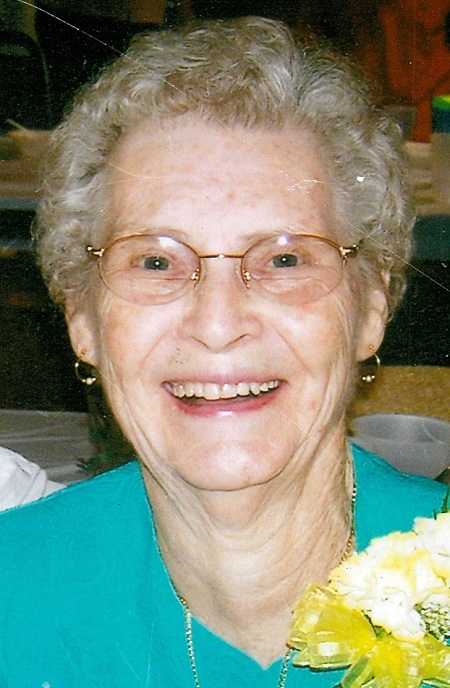 She enjoyed dancing, quilting, cooking, playing euchre and attending bluegrass festivals and most of all, having family gatherings. Surviving is her husband of 77 years, Raphael Dupont; her children, Mary Carparelli (Peter), Helena, MT, Janice Hagman-Etienne (J.B.), Tell City, Doug Dupont (Phyllis), Sebring, FL, Jim Dupont (Donna), Cannelton, Mike Dupont (Nan), Tell City, Daniel Dupont (Claudia), Tell City, and daughter in law, Monica Dupont-Tunks (Jeff), Derby; a sister, Muriel Peckinpaugh, Tell City; a brother, Bill Howell, Tell City; 25 grandchildren, 7 step grandchildren, 55 great grandchildren, 13 step great grandchildren, and 18 great-great grandchildren. Preceding her in death were her parents; a son, Chris Dupont; great grandson, Christopher Earl Reiter; son in law, Bob Hagman; sisters, Alberta Goffinet, Evelyn Simpson, Cecil Peckinpaugh and Marie Labhart; brothers, Bethel, Ralph, Vernon Lee and Paul Howell. A Mass of Christian Burial will be held at 10:00 AM CDT Tuesday, September 11, 2018 at St. Mark Catholic Church. Rev. Dennis Duvelius will officiate. Burial will follow in St. Augustine Catholic Church Cemetery. Visitation will be Monday from 3:00-7:00 PM and Tuesday 8:30-9:30 AM at Huber Funeral Home, Tell City Chapel. Memorial contributions may be made to St. Mark Catholic Church, Heart to Heart Hospice or Golden Living Center Activity Fund.